A NATURAL disaster of monumental proportions is unfolding in northwest and central western Queensland, with fears of substantial losses among drought-weakened cattle after ten days of relentless, torrential rain. A region from west of Hughenden all the way to Cloncurry and north into the gulf region has received unprecedented falls of 400-600mm or more over the past ten days, turning large parts of the essentially flat region into an inland sea (see today’s weekly rainfall summary). It will be weeks before vehicles can get across the country, but aerial inspections are painting a grim picture about the conditions, suggesting stock losses in some areas will be severe. Pockets of already drought-weakened stock are gathered on high-points like turkey’s nests all over the region – many of which have not had access to feed for days. Beef Central spoke to a range of cattle producers across the region from Richmond to the Northern Territory border this morning, who said it would be weeks before a true assessment of the extent of damage could be made. Opinions about the likely extent of stock losses varied, but most agreed that there will be some substantial losses among already weakened stock succumbing to exposure, bogging, prolonged lack of feed and simply being swept away in floodwaters. AgForce chief executive Mike Guerin said although it was too early for a precise estimate of the financial cost from livestock losses and damage to property and equipment, it was likely to be in the hundreds of millions of dollars. “While the logistics are still to be worked out, the Australian defence force will use its aircraft to help our farmers,” agriculture minister David Littleproud said. “Thousands of cattle are cut off by floodwaters and we had to act decisively to stop them from starving,” he said. Federal Member for Kennedy, Bob Katter, whose sprawling electorate is heavily impacted by the flooding, said North Queensland’s mid-west – an area of a million square kilometres – was an emerging catastrophe. “The situation has dramatically worsened over the last few days,” Mr Katter said. “Cattle cannot move around on the heavy black soil, they cannot forage for food, they are in a very poor and weakened position, after what had been a very long dry,” he said. 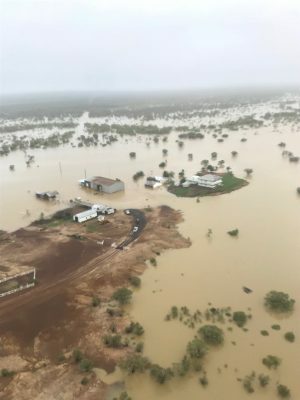 Mr Katter’s son, state member for the Mt Isa-based seat of Traeger, Robbie Katter, said northwestern Queensland graziers were losing stock by the hundreds due to torrential rain and flooding. He said producers were forced to sit idle as excessive and unrelenting rainfall, flooding, cold winds and a lack of grass was leading to catastrophic stock losses. Queensland’s state farm organisation AgForce has established a crisis management team to help affected producers receive the support they need to come through the episode. An immediate need for many is for fodder to be airlifted to isolated cattle, many of which are weakened by years of drought. Producers who need fodder are encouraged to contact AgForce or their Local Disaster Management Group, via their local Council. 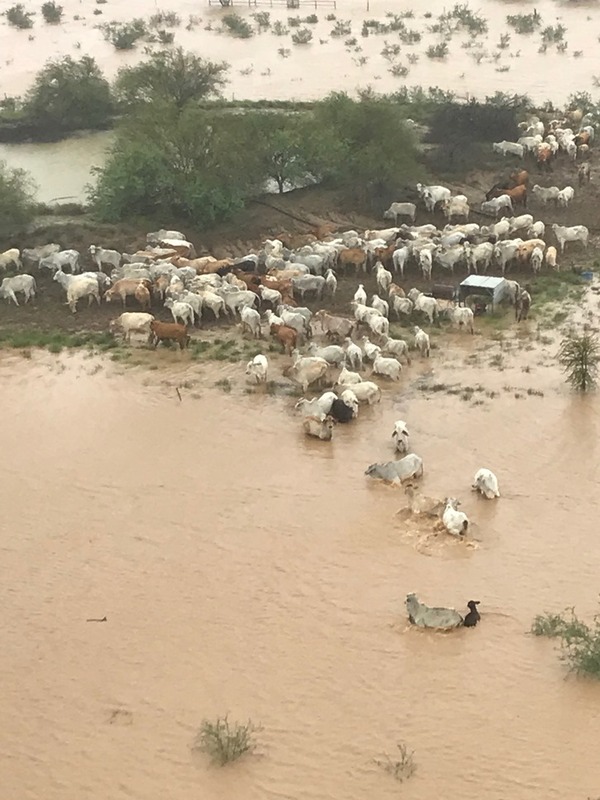 “This is absolutely heart-breaking for producers who have expended enormous amounts of money and energy keeping their herds alive through the drought, only to see them now devastated by floods. Our crisis management team will meet daily to move issues up to the highest levels of Government to ensure situations are quickly recognised, responded to, and no areas are left overlooked,” he said. Former Cattle Council of Australia vice president Peter Hall, who has country around the Cloncurry and Julia Creek region, said given the conditions, it was still too early to assess the extent of stock losses or damage to infrastructure in his region. “As a general rule, properties around here have had an incredible 500-600mm of rain in the past seven or eight days, and similar around Julia Creek and further south towards Kynuna,” he said. Richmond stock agent Ashley Naclerio, from Stockplace Marketing, painted a picture of devastation in his area, saying many local cattle producers were yet to start to assess damage and stock losses. “Average falls here have been around 500mm, but some places have had a lot more,” he said. Mr Naclerio said six helicopters were currently operating ‘flat-out’ out of Richmond, doing emergency runs, fodder drops to isolated cattle, and shooting bogged cattle. In some cases, stranded cattle that had already been fed from the air became bogged around the dropped hay, and perished. “Everyone is trying to get out and do the best they can, but it will be two or three weeks, at least, before anybody can get out onto paddocks themselves. Fencing will be basically non-existent anywhere along the Flinders River,” he said. While areas further east around Hughenden are nowhere near as badly affected, having received around 200mm of rain, some much bigger falls were recorded north of Hughenden in the basalt country. While the weather would create devastation short-term, good growth should follow in buffel, Flinders and Mitchell grasses, and winter herbage heading into winter. Richmond beef producer Betty Witherspoon, whose property Maroola Station is 120km from town, said she was among the many in a hopeless situation. “We have had 660mm (26 inches) of rain here in a week. I have been here for 32 years and that is just unheard off,” she said. Mrs Witherspoon said she and her family had tried desperately to get to their cattle to feed hay but relentless rain and waterlogged paddocks meant they were bogged almost as soon as they left the homestead. Further south at NAPCo’s Kynuna station, more than 600mm has been received since late January, but conditions have not allowed any assessment of stock or fencing losses to this point, Beef Central was told. In the Gulf region, AA Co’s Canobie and Wandoola stations are experiencing a significant rain event, and there is a major flood warning for the Flinders and Cloncurry Rivers. The company denied early anecdotal reports that stock losses on both properties had been substantial. “It is far too early to assess what the impact on livestock will be. We will likely only know more once flood waters have started to properly recede,” a company spokesman said. “Our focus – like all producers in the area – is on animal welfare as our number one priority. The operations team had planned ahead of the rain event, and have had a strategy in place which has allowed forward-planning of helicopters, fuel and feed. The size of the rainfall and volume of water has added some complexity to the way we respond,” the company said.